A secretive Democratic consultancy is hiring one of Sen. Jon Tester’s (D., Mont.) top campaign staffers after using a web of affiliated groups to attack Tester’s 2012 challenger. Hilltop Public Solutions, which has refused to answer questions about its ties to a number of liberal political groups, will hire Aaron Murphy, a long-time Tester staffer and his 2012 campaign’s communications director, according to an emailed statement from Hilltop partner Barrett Kaiser. "Murphy was a top adviser to Tester for nearly seven years as the senator’s communications director, chief spokesman and speechwriter," Kaiser’s email said. "In 2011 and 2012, Murphy oversaw communications, press and social media on Tester’s successful and highly regarded U.S. Senate campaign." Kaiser is Hilltop’s director of western operations, and works out of the firm’s Billings, Mont., office. He is a former staffer for Sen. Max Baucus (D., Mont. ), and consulted for Tester’s 2006 campaign. The move deepens the consultancy’s ties to the sitting Montana senator. Hilltop actively engaged in Tester’s reelection fight through a handful of AstroTurf groups. Kaiser himself filed Federal Election Commission paperwork for Montana Hunters and Anglers Action!, the activist arm of a group credited with tipping the race in Tester’s favor by backing a spoiler Libertarian candidate. Montana Hunters and Anglers, the group’s affiliated political action committee, listed Hilltop associate Joe Splinter as its treasurer. The group ran at least two television ads hitting Rep. Denny Rehberg, Tester’s 2012 opponent, for supporting legislation that would give the Department of Homeland Security some authority over public land in the state. Hilltop partner Jeremy Van Ess is listed as an officer of another group that was active in the Montana Senate race: the Citizens for Strength and Security Fund. That group ran at least three television ads and two radio ads attacking Rehberg. Tester’s campaign echoed many of the attacks from both the Hunters and Anglers and Citizens for Strength and Security Fund ads, including charges that Rehberg violated a pledge to refuse pay raises, voted to give the Department of Homeland Security control over Montana land, and voted for the Patriot Act and Real ID immigration legislation. Murphy did not respond to requests for comment. Aaron Murphy, the former communications director for U.S. 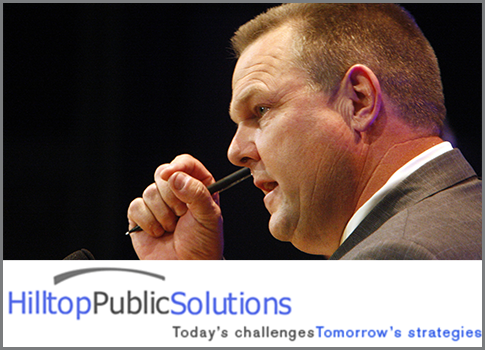 Senator Jon Tester, joins Hilltop Public Solutions this week, bringing years of experience in politics and journalism to the national strategic firm. Murphy will join the Hilltop team on February 1 as a principal, serving clients out of the company’s office in Billings, Mont. Murphy was a top adviser to Tester for nearly seven years as the senator’s communications director, chief spokesman and speechwriter. In 2011 and 2012, Murphy oversaw communications, press and social media on Tester’s successful and highly regarded U.S. Senate campaign. "Senator Jon Tester expects and inspires hard work, accountability and integrity from the people who work for him and after years of serving Montanans in his office and on his campaigns, I look forward to this new chapter with Hilltop's world-class team," Murphy said. Prior to his political career, Murphy was executive producer at KTVQ-TV in Billings, Mont., and a producer at KGW-TV in Portland, Ore. A native of Wyoming, he is also a former Yellowstone Park Ranger. Murphy is a graduate of the University of Montana and its School of Journalism. With two top-tier U.S. Senate campaigns and years of Capitol Hill work under his belt, he is an experienced political strategist with an emphasis is in media and communications. Hilltop Public Solutions is a public affairs firm specializing in campaign management, coalition building, grasstops organizing and strategic communications. Since opening its doors in 2006, the firm team has earned a reputation for managing high-stakes public affairs campaigns. The Hilltop team consists of veterans of politics and government. Hilltop’s partners and principals have managed presidential campaigns, communicated on behalf of Senators, designed massive mobilization efforts and overseen some of the largest issue campaigns in recent history. "We are thrilled to have Aaron join the Hilltop team," said Barrett Kaiser, the firm’s director of western operations. "There are few people with the smarts, talent, and political acumen as Aaron Murphy. He brings a tremendous amount of experience and skill to our team." This entry was posted in Politics and tagged Congress, Denny Rehberg, Jon Tester, Progressive Movement. Bookmark the permalink.